The father of women’s soccer at Drexel is seeing his team come of age as it hovers within reach of a tournament title. 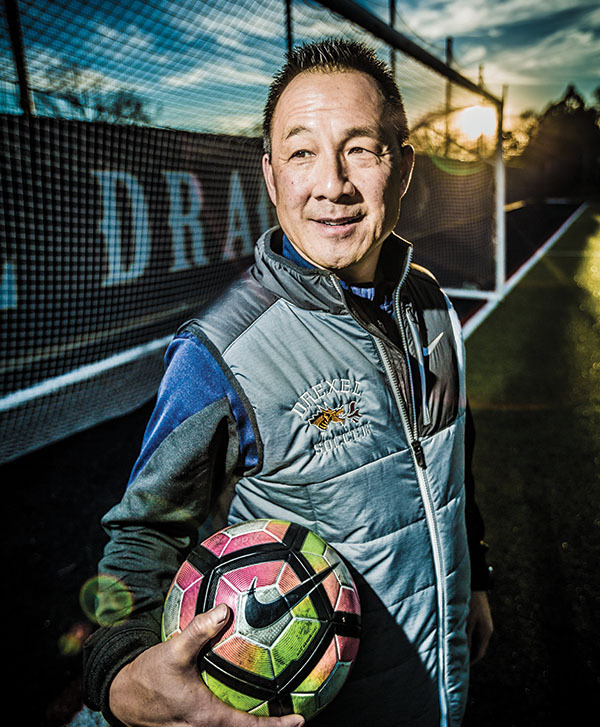 The history of Drexel women’s soccer starts — and stops — with Ray Goon. Last season was one of the most impressive for both the program and its founding father. The Dragons reached their first-ever conference tournament title game, and Goon was named Colonial Athletic Association Coach of the Year for the second time in his 20-year career. Drexel fell short of its ultimate goal, losing to Northeastern in the CAA final. But along the way it racked up nine victories, including its first-ever postseason one, a 2-0 win over James Madison in the semifinals. While the way the storybook season ended certainly stung, Goon is confident that the final chapter is not yet written. Experience is an attribute of which Goon has boatloads. When Drexel established its women’s soccer program two decades ago, it turned to the successful coach from crosstown Philadelphia University to lead it. Goon had posted a 28-9-2 record from 1994–95, and was a soccer lifer. A New Jersey native, he began playing the sport around age 7, following in the footsteps of two older brothers. He went on to play collegiately at Rutgers, where he was a member of the Scarlet Knights’ 1983 team that went undefeated during the regular season. With few pro opportunities available in the United States back then, coaching seemed a natural progression. At Drexel, he was afforded the rare opportunity to assemble a program from scratch. They’ve done it. Drexel has qualified for the postseason conference tournament three of the past five seasons. Goon coached CAA Defensive Player of the Year Eve Badana in 2012, and Rookie of the Year Vanessa Kara in 2015, and last season, goalkeeper Christiana Ogunsami won Co-Defensive Player of the Year honors. Molding young minds is as important to Goon as developing athletes. Last season, 21 of his 26 players received the CAA Commissioner’s Academic Award, and 11 made the Dean’s List. Overall, the team posted a 3.45 overall GPA for the fall term. Goon is hoping those accomplishments translate from the classroom to the field. Next year, the Dragons won’t be satisfied simply making it back to the CAA final. After so many years at the helm, Goon is more excited than ever for what the future holds. Keep up the good work Raymond! Congratulations Ray! Thanks for all your help through the years! I’m proud of all you have accomplished and happy to be a co-worker and friend.